Well dog my cats!! It’s time again for She-Bang! 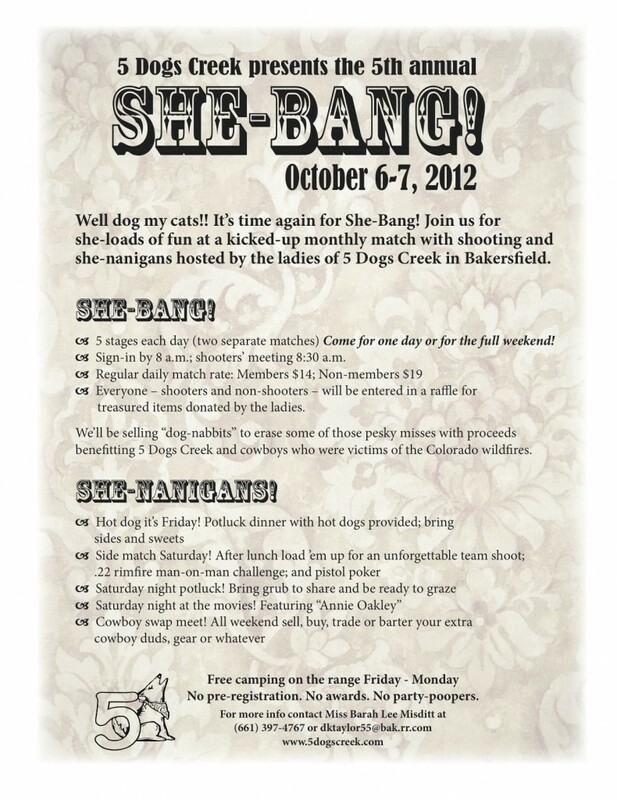 Join us for she-loads of fun at a kicked-up monthly match with shooting and she-nanigans hosted by the ladies of 5 Dogs Creek in Bakersfield. * 5 stages each day (two separate matches) Come for one day or for the full weekend! * Sign-in by 8 a.m.; shooters’ meeting 8:30 a.m.
* Everyone – shooters and non-shooters – will be entered in a raffle for treasured items donated by the ladies. We’ll be selling “dog-nabbits” to erase some of those pesky misses with proceeds benefiting 5 Dogs Creek and cowboys who were victims of the Colorado wildfires. No pre-registration. No official awards. No party-poopers. We sit around the Giants game and plan our food items. We will be leaving Friday am to join you folks. The ” we” will be Nasty, Bonny Kate and myself! See you there! We would love to join in the fun at She-Bang this year, but we’re not sure what all we’ll need to bring for the side matches. Is there a list anywhere outlining the various matches and a schedule of when everything takes place? Believe me, it’s not that I’m uber organized, but we’re new to this and don’t know how it goes (and we don’t want to miss anything!) Thanks. Any other “Nasty’s” out there that can’t decide to come shoot at She-Bang? Let me tell ya a bit about it. Fun, sometimes challenging stages, some very fast stages, some that “we’re moving, we’re moving’, and some stand and deliver. We will have a BB Gun challenge side match on Sat., a 4 (-count them 4-) man team shoot side match and a 22 challenge. Do ya ever get hungry?? Well here is a great place to remedy that situation. 5 Dogs has many good no great cooks! We will have a raffle on both Saturday and Sunday. Tickets are FREE just for registering to shoot! Dog-Nabbits will be for sale 5 for $10.00 Heck of a deal to buy back some pesky misses that could mess up your clean match! Not to mention the proceeds will help Colorado Cowboys that lost everything in the wild fires in Colorado; and a portion of the proceeds will be given to a “Local Wounded Hero” which funds are being raised to build him a home that is handicap excessible. You just can’t do any better than that folks! Saturday night we will be viewing “Annie Oakley”. So if you would like something fun and entertaining to pass your time on Oct. 6th adn 7th, come on over to 5 Dogs! We would love to see ya!! Howdy Doody, I have sent you an email as per your request but have not received a reply back from you. Please try my email. I hope to hear from you soon! I won’t miss this one! Sounds like to much fun. Good Lord willing and the creek don’t rise ~ ~ ~ I plan on being there! Still working on Nasty, haven’t heard back from him yet! This will be my FIRST “She-bang”! Miss Barley Missdit could you contact me at shoot6guns@yahoo.com re: a glass for She Bang? Sounds like a lot of fun !! !